The use of the T2 filter in NMR studies allowed us to separate carbon atoms by their mobility in different fragments of the macromolecular chain of polyisoprene synthesized by cationic polymerization. 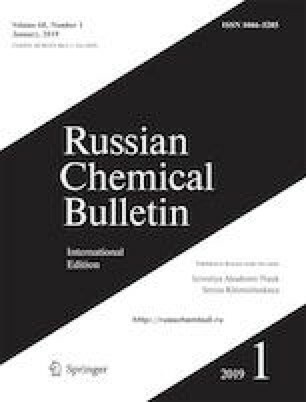 The NMR signals of terminal units with conjugated double bonds were identified for the first time for the “cationic” polyisoprene, which experimentally confirmed the transfer of the growing chain to the monomer in the process of cationic polymerization of isoprene. Published in Russian in Izvestiya Akademii Nauk. Seriya Khimicheskaya, No. 1, pp. 0116–0120, January, 2019.